While doing the ketogenic or very low carbohydrate diet, I have been missing pasta, but not so much the pasta, but the sauces that go along with them. I love spaghetti sauce! It is so delicious! I love the combination of tomatoes, olive oil and basil. Today, I made a low carb spaghetti sauce and put it on top of spaghetti squash. 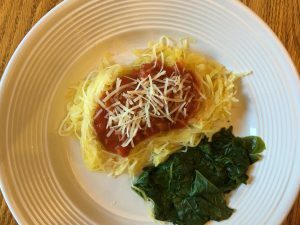 While the spaghetti squash is a healthier option than noodles, it doesn’t really replicate the noodle texture all that well. However, it does provide a great base for the sauce, which is where all the flavor in a dish of spaghetti is anyways! On medium heat, saute the sausages, onion, garlic, celery and mushrooms for 1-2 minutes. Add in the canned spaghetti sauce and seasonings – Italian seasoning, salt, pepper, olive oil. Let simmer on low for 20 minutes. Today, I used the Kirkland brand of tomato sauce, which actually did have some added sugar, but the carbohydrate count was pretty low, so it still fit into my macros. I decided to search online for a better option and discovered that Hunt’s has a no sugar added canned pasta sauce, which would probably be a great option. It is zero carbohydrates and the added mushrooms, onions and sausage that you add would make it taste great if it doesn’t already! The other thing that you may want to purchase is a nice Italian seasoning. Check out my ketogenic chili recipe! For ideas on the best ketogenic snacks click here! I feel like you read my mind when I came across your low carb spagehtti sauce! I too am now mostly low to no carbs and yes I too miss the sauces much more than the pasta. I’m from Australia, do you know if squash is the same as our zucchini vegetable here? I will be making this sauce tomorrow, it is in the evening here and I have already eaten. Looking forward to it, thank you for sharing! I’m not sure if it is the same as your zucchini. I know that in the United States, some people make zucchini noodles by spiralizing the squash. Spaghetti squash is a type of squash that is different. It has stringy squash strands inside it. I will be uploading a picture for the website soon. Just came across this excellent recipe of yours and I must admit I did enjoy going through the various pages of your website. Thanks for sharing such useful and healthy information. I really look forward to your next article. I have a question though: do you intend to publish an eBook regrouping your recipes? That’s a great idea! I just may publish an eBook in the future. I will try this recipe. How can you say this is a low carb recipe? Hi! The highest carbohydrate count ingredient in the spaghetti sauce is 5 carbohydrates per serving. Therefore, one serving will easily fit into a low carbohydrate diet, especially when you average in other zero carbohydrate ingredients such as olive oil and sausage. Interesting post, I never considered making a low carb spaghetti sauce before. This is fantastic, thanks for sharing it! Can’t wait to try it out. Thanks so much for your comment and visiting my website! Best of luck in your efforts to try out the spaghetti sauce! We have a low carb lifestyle in the household, and we make spaghetti out of beans. You still can’t eat as much because it does have some carbs. Try making the sauce from scratch. You can control the sugar content that way. You’ll need to put a few tomatoes in the oven until the skin peels off. Take the pulp and mix it into a sauce pan. Use only cream as a thickening agent (no starches). Add your other ingredients as you like. Ok, now I’m hungry imagining how this would taste like. Thanks so much for that idea! I’m not sure about making them from beans as I tend to get a bit of gas from them. Beans are not very low carb, either, so you may want to reconsider. You may want to check out the FREE cookbook, Bacon and Butter, to get some great low carb recipe ideas. The free digital version is designed for people following the ketogenic diet, but works well for those who are simply low carbohydrate as well! great page. a lot of info and recipes to check out. i’m a coconut oil lover too. i love your header on this site. i gotta try this low carb spaghetti sauce recipe. it looks so good.